Following Germany’s invasion of Poland, which started WWII, Britain and France declared war on Germany but did not actually attack the Germans. Although the Royal Navy blockaded German ports, and German U-boats and surface raiders hunted Allied shipping, the situation in Europe remained deceptively calm. In fact, it was so calm that people described the war as the Phoney War. While the combined forces of Holland, Belgium, Britain and France outnumbered Nazi Germany, Holland and Belgium remained neutral, even after Germany invaded Norway and Denmark. As a result, Holland and Belgium did not coordinate with France and England to plan a combined reaction to a German offensive. France had been a battlefield during WWI and the losses to French manpower had been so extreme that the nation had not fully recovered more than twenty years later. Hoping to avoid a repeat of the previous war, the French had constructed a supposedly impregnable series of fortifications, the Maginot Line, to hold off any German army while a counter-offensive was prepared. Both the French and British military leadership thought that armies moved as slowly as they had in WWI, but the Germans had developed fast-moving armoured units that had trained to work in tandem with Luftwaffe bombers. More important, the Germans launched a two-pronged offensive on May 10, 1940. One prong moved through Holland and Belgium to distract the Allies, while the second prong, made up largely of armoured units, made its way through the Ardennes Forest, where the French defences were weak, thus trapping the Allied armies in a pincer. General Maxime Weygand replaced General Maurice Gamelin as commander of the French army on May 18, but Weygand’s attempts to organize a counter-offensive failed because the reserves needed for a counter-offensive did not exist. Faced with the destruction of the British Expeditionary Force (BEF), General the Viscount Lord Gort, the commander of the BEF, decided to fall back to the Channel ports and evacuate the British army, so the Royal Navy mobilized an astonishing fleet of ships, including civilian ferries and personal motorboats, to save the BEF at Dunkirk. American pilot Tim Baker (Power) gets a high-paying job ferrying bombers from Canada to England, where he runs into ex-girlfriend Carol Brown (Grable), who had left him after he had cheated on her too many times. A popular dancer in nightclub acts, Brown’s numerous admirers include Wing Commander Morley. Hoping to impress her, Baker joins the Royal Air Force (RAF), and they rekindle their relationship. Expecting to become a fighter pilot, Baker is disappointed to be assigned to Morley’s bomber squadron, unaware that his commander is also a rival for Brown. Although war has been declared on Germany, it is still in the Phoney War stage, so they drop leaflets, not bombs, over Germany, to the vocal disgust of Baker. Tiring of Baker’s nonchalant attitude to their relationship, and realizing that he will not change, she breaks up with him. When the Germans cross the borders of neutral Belgium and Holland, the RAF starts dropping bombs, not leaflets. The war hits home for Baker when friends start dying. The Germans had moved much faster than expected and the British army is forced to retreat to the coast of France. After volunteering for a Spitfire Squadron, Baker is sent to provide air cover for the evacuation of Dunkirk, where troops are being bombed while queueing up on the beaches to board ships. Learning that Baker has started to take the war more seriously, Brown re-examines her feelings for him. Although London is prepared for war and the military is conducting practice air raids, the fighting had not started when Baker arrived in England. Bizarre as it may seem, but the British only dropped leaflets on Germany even though the two countries were officially at war, and Germany had already invaded Poland. This refusal to actually do anything warlike is why the period from September 1939 to May 1940 was called the Phoney War. It is a propaganda film, so all of the RAF pilots shoot down two or more enemy planes. In reality, RAF coverage of Dunkirk was not always effective and the numbers of planes shot down were usually even. More important, the dogfights usually took place away from the beaches, so the soldiers felt deserted by the RAF. To a degree, they had been. Air Chief Marshal Hugh Dowding, commander of RAF Fighter Command, had limited the number of squadrons assigned to protect the evacuation at Dunkirk in order to preserve his squadrons to defend Britain against an expected German invasion. A month after the evacuation, the Luftwaffe (German air force) began its campaign to destroy the RAF in preparation for an invasion of Britain. Although the RAF won the Battle of Britain, it was a narrow victory, so Dowding’s tightfisted attitude was proven justified, but the soldiers on destroyers running a gauntlet of Stuka dive-bombers had more immediate concerns. Since the movie was made during the war, Britain naturally had an abundance of wartime footage, so a massive dogfight during the film is taken from real footage. 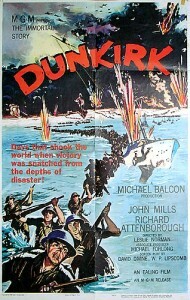 Most of the movie, including the evacuation scene, was filmed in the United States, but a second unit had shot footage of planes taking off and landing in Scotland. There is quite a lot of humor in the movie because Lord Beaverbrook, Minister of Air Production, had said that the British had already experienced enough drama and requested more comedy. The sharp dialogue makes it a very entertaining propaganda film, which is good since it is not particularly effective propaganda. The film’s message seems to be that if you fight for a cause you get Betty Grable. Believing that war was coming, Darryl F. Zanuck, head of Twentieth Century Fox had been commissioned a Reserve Lieutenant Colonel in the Army Signals Corp in January 1941, so he had begun producing propaganda before Pearl Harbor. Determined to help convince Americans to enter WWII, Zanuck had assigned Grable and Power, two of the studio’s biggest stars, to the movie and ensured that it was made quickly, so the script says little about the war itself, other than that the British are charming and plucky. Admittedly, most Americans were familiar with the events in Europe, but a little more attention could have been paid to the war, instead of simply pointing out that Germany was invading neutral nations, especially since the movie was made after the Battle of Britain. Inexplicably, no mention was made of Poland, even though the German conquest of Poland was the official cause of the war. Grable’s famous legs appear first, and then the rest of her. Several forgettable dance numbers are performed in order to give Grable an opportunity to showcase her legs. Proving that she is more than a pair of finely-formed legs, Grable’s rapid delivery enables her to more than hold her own with Power, and there is a good chemistry between them. Resisting the urge to soften his character’s rough edges, Power’s Baker is so arrogant that he treats everything as a joke and fails to realize that Brown simply wants him to be serious. In fact, Power is so effective as a cad that the scheming becomes repulsive after a while. 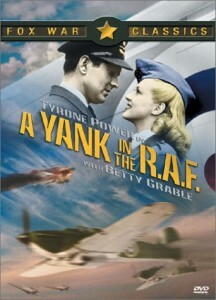 The story follows the formula of the cocky showoff who can only get the girl after he realizes that the world does not revolve around him, but the wartime footage is excellent, and Reginald Gardiner steals every scene as Roger Pillby, Baker’s debonair friend, whose sole ambition in life is to meet Brown. 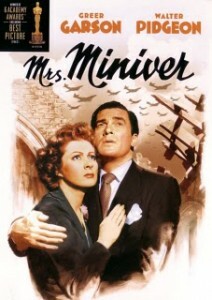 The film was one of several unabashedly propaganda movies, including Mrs. Miniver (1942) and Sergeant York (1941), that were produced by the studios to encourage Americans to enter the war. It is not the best of the lot, but it is definitely a worthy effort.